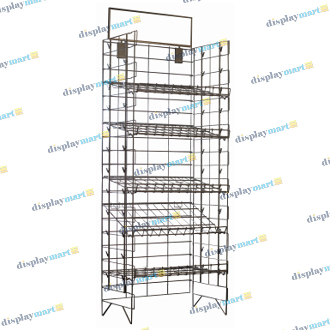 Attract impulse sales with the wire shelf display stand found on DisplayMart.com. Assemble with ease! Simply unfold each side and set the five included shelves into place. Each shelf can be installed flat, or at three different angled positions providing multiple display options. Other features include 24 clips down each side of the stand, and a 7”H X 22”W top card holder for advertisement. Easily display chips, candy, hats, clothing, literature and magazines in convenience & retail stores alike.